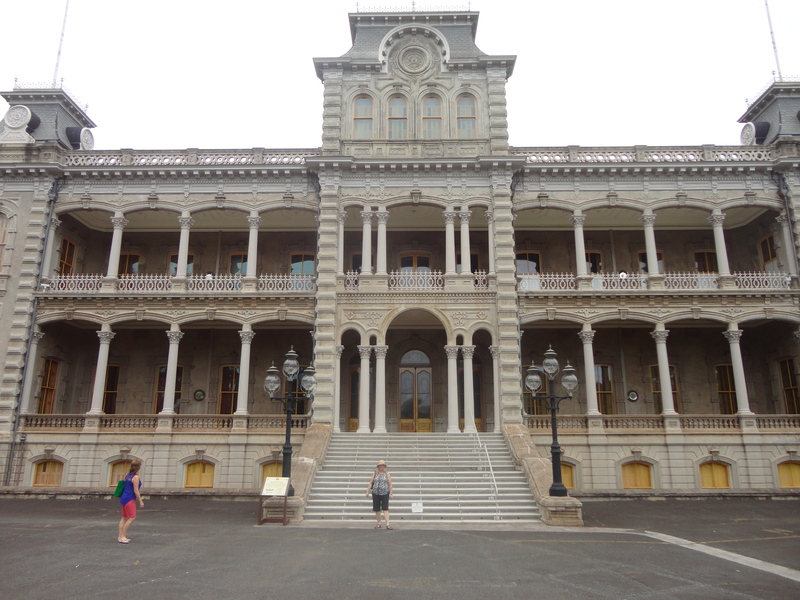 While in Oahu, one of the stops I wanted to make the Iolani Palace, the only royal palace (at least that I could find mention of) on American soil. Located in downtown Honolulu, the palace is across the street from the State Capitol bringing new and old history together. In December of 1882, King Kalakaua and Queen Kapiolani took up residence in their new home which although at first was known as Hale Alii (House of the Chief), King Kamehameha V changed its name to Iolani Palace with Io being Hawaiian hawk, a bird that flies higher than all the rest, and lani denotes heavenly, royal, or exalted. Although we were only to view the outside of the palace and the lovely grounds due to time constraints, I read that the palace had all the modern things like electric lights and more and I was able to view the inside online. It was interesting to note that King Kalakaua was a modern type of guy and the first Hawaiian king to visit the US and saw President Grant at the White House. This US association would later deeply relate to the end of the royal rule. King Kalakaua was a descendant of the chiefs of Kona who aided Kamehameha I in his conquests and in the consolidation of the Hawaiian Islands into one kingdom. The palace website states, “King Kalakaua successfully negotiated a reciprocity treaty which allowed Hawaiian sugar into the United States duty-free and products made in the United States into the Kingdom duty-free. In 1881, Kalakaua distinguished himself once again by being the first monarch to circumnavigate the globe. While a modern ruler, he wanted to ensure that the Hawaiian culture stayed intact so he a encouraged the transcription of Hawaiian oral traditions, and supported the revival of and public performances of the hula, which had been banned earlier in the century. When he fell ill, a doctor advised that he go to the US for a change of climate which is hard imagine since Hawaii had the best climate I have ever seen. Revered by westerners, he lay in state and received visitors from all over to pay their respects. Succeeded by his sister, Liliuokalani, she was proclaimed queen on January 29, 1891. Known a talented musician and accomplished composer Queen Liliuokalani wrote approximately 165 songs, including Aloha Oe. The Queen’s reign would be short lived. She tried to strengthen the political power of the Hawaiian monarchy by creating a new constitution. This would be her downfall when opposition composed primarily of Hawaii born citizens of American parents, naturalized citizens and foreign nationals along with the support of the American Minister to Hawaii orchestrated the overthrow of the Hawaiian monarchy. Yielding her authority to keep violence at bay, she wrote, “… Now to avoid any collision of armed forces, and perhaps the loss of life, I do this under protest and impelled by said force yield my authority until such time as the Government of the United States shall, upon facts being presented to it, undo the action of its representatives and reinstate me in the authority which I claim as the Constitutional Sovereign of the Hawaiian Islands. In 1895 Hawaiian royalists attempted to restore Queen Liliuokalani to power. Thinking she was in the know, she was arrested and forced to sign a document of abdication that relinquished all her future claims to the throne. I read in a history by Queen Liliuokalani, the following words when she was informed she would die for the uprising, “FOR the first few days nothing occurred to disturb the quiet of my apartments save the tread of the sentry. On the fourth day I received a visit from Mr. Paul Neumann, who asked me if, in the event that it should be decided that the entire principal parties to the revolt must pay for it with their lives, I was prepared to die? I replied to this in the affirmative, telling him I had no anxiety for myself, and felt no dread of death. He then told me that six others besides myself had been selected to be shot for treason, but that he would call again, and let me know further about our fate. I was in a state of nervous prostration, as I have said, at the time of the outbreak, and naturally the strain upon my mind had much aggravated my physical troubles; yet it was with much difficulty that I obtained permission to have visits from my own medical attendant. She indicated that she had to sign the relinquishment in order to save those in the uprising from the death sentence. They had a trial in her former throne room. Queen, Liliuokalani was fined $5,000 and sentenced to five years in prison at hard labor although she was released after a few months of imprisonment in an upstairs bedroom of Iolani Palace. While visiting we saw a sign where someone had painted, “Free the Queen”. At other sites during our visit in Maui we saw the former Hawaiian flag and notes of Hawaiian sovereignty not unlike flags and comments we see from the former Confederacy in the south today. Rather late, but at least offered, I read that in 1993, 100 years after the overthrow, President Clinton signed a Congressional Resolution (Public Law 103-150) in which the United States government formally apologized to the Native Hawaiian people. For more information about the Queen, you can read her own story at http://digital.library.upenn.edu/women/liliuokalani/hawaii/hawaii.html#XXXII I found it rather fascinating. Next Post: Shrimp from Giovanni’s Shrimp Truck!